Constructing a 100,000-watt FM radio station isn't easy. When the construction involves building a 2,000-foot tower, it is probably a good idea to bring in outside help. Cumulus Media chose Dielectric to handle turnkey design and construction of its new 2000-foot tower and associated transmission facility serving the Houston, Texas market. The facility has two sets of transmission equipment and main and auxiliary antennas, providing a fully redundant system. The RF system includes Dielectric motorized coax switches and two 4-1/16-inch transmission lines. Dielectric is also supplying the dehydrator system for the lines, Flash Technologies brand high-intensity strobe lighting, and a monitoring system. Dielectric's Alarm Response Center will provide 24-hour a day monitoring services to Cumulus Media. John Capasso, president of Dielectric Communications, commented, "We are proud to have been chosen by Cumulus Media for this landmark project. This will serve as yet another demonstration of our ability to offer our customers complete engineered and project managed systems safely, cost-effectively, and efficiently. 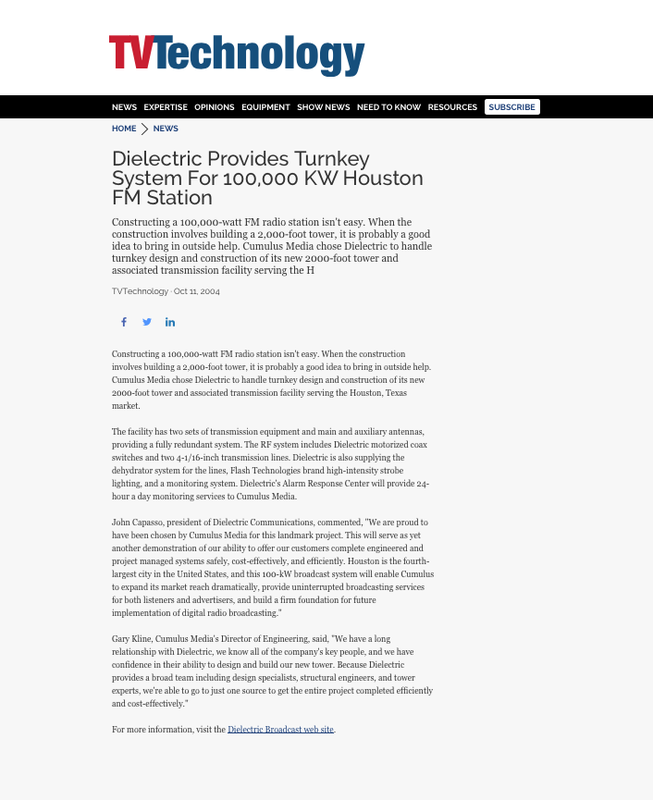 Houston is the fourth-largest city in the United States, and this 100-kW broadcast system will enable Cumulus to expand its market reach dramatically, provide uninterrupted broadcasting services for both listeners and advertisers, and build a firm foundation for future implementation of digital radio broadcasting." Gary Kline, Cumulus Media's Director of Engineering, said, "We have a long relationship with Dielectric, we know all of the company's key people, and we have confidence in their ability to design and build our new tower. Because Dielectric provides a broad team including design specialists, structural engineers, and tower experts, we're able to go to just one source to get the entire project completed efficiently and cost-effectively." The facility integration was handled by Dave Supplee, with the help of Gary Zocolo, Cumulus - Youngstown who handled much of the detail wiring in the studios. Lightner Electronics of Claysburg, PA, punched down the studio trunk cables and provided several harnesses for the recycled consoles. Alf Long and Mike Mackenzie of Cumulus - Harrisburg assisted in the construction and the move of the stations. IT wiring and satellite work was done by Skyline Communications, Indianapolis, IN. Photos by Scott Giambalvo, HarrisburgPA.com. "I'm standing there with the lavaliere microphone, and we have just moments before we go live for his talk show, and he's all wet." So Kline had to get creative. As the coach sat down in a chair, the engineer gingerly rested the mic on Knight's ample stomach. "By that time he had thrown on a pair of pants, at least," Kline said, laughing. While he doesn't count the Knight incident as a career highlight, Kline said it's a good example of how engineers are expected to think on their feet. Kline has improvised his way to the post of corporate director of engineering for Cumulus Broadcasting, where he oversees technical aspects of operations at the group's approximately 260 radio stations in 60 markets. 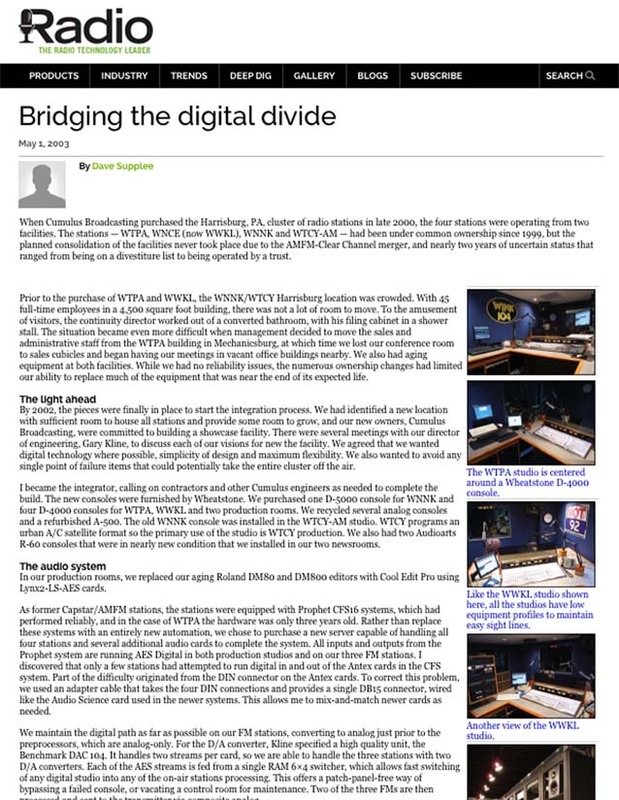 "Ultimately, my responsibility is to keep our stations on the air. I do it with the help of a great engineering staff at the station clusters," Kline said. "I played with electronics and took apart radios at my grandparents' house as a kid. As I got older I could actually put them back together. They were happy about that," he said. "That's where I started to learn about current, voltage and tubes in a radio. That really formalized my beginnings in electronics." "I called WYNY(FM) and told them there was classical music in the background. Their chief engineer called me back a few days later and said they had discovered bleed-over from an STL. He thanked me for pointing out the problem and invited me for a station visit," Kline said. "I spent seven weeks in the summer of 1980 studying digital and analog electronics with college professors at Ball State University and got college credit for it," Kline said. "I don't know if I would go through all of that again, because it was a lot of work; but I'm glad I did. I had a great deal of electronics experience already under my belt going to college." "My father was a civil engineer, and he always told me, 'Gary, go into business. Be the guy who tells the engineers what to do.' So I chose business as my major," Kline said. Kline worked for Purdue University radio station WBAA(AM) his first year. He announced and learned about equipment by watching the station's veteran engineers. "I also worked for my dorm's radio station. Each dorm had its own radio station with turntables, a cable modulator and maybe a couple of cart decks ...whatever they could scrounge up to work. I eventually became program director for my dorm's student-run WLAY. I loved it." His first professional radio experience came at what was then WXUS(FM) in Lafayette, Ind. "I worked the midnight-to-9 a.m. shift Sunday mornings. And yes, that included running 'Powerline,'" Kline said, referring to the long-running Christian radio program from the Southern Baptist Convention Media Technology Group. "My schedule during school was incredibly busy. I was so immersed in radio ... I was also working on several projects in Colorado. It slowed my schooling down, and didn't help my grades all that much, either," Kline said. "The day after I graduated, I was in a car on my way to Fort Collins, Colo., to build some studios as the group's director of engineering," Kline said. "I still think the travel is the best part of my job at Cumulus. That's good, because I'm on the road just about every day," he said. In 1999, Kline received an e-mail from Terry Baun, then director of engineering for Cumulus. It would set his ensuing career path. It's a message Kline still saves on his computer. In part Baun wrote, "We are thinking about hiring another corporate-level person, perhaps to plan and manage build-outs/consolidations and perhaps be our processing guru. Any interest there?" Kline said he was immediately intrigued. "It felt as if I was working myself to death ... building new studios while working around the clock with very little help. I was ready for a change." He officially became corporate director of engineering for Cumulus in January of this year. He had been acting in that capacity and running his own consulting engineering company since Baun's departure in October of 2000. "I don't have a large staff like a few of the other group engineering directors do. So I have to get out and do most of the travel myself. I'm usually on the road from Sunday night through Friday night," Kline said. "I still get a kick out of visiting radio stations and seeing what their studios and transmitter facilities are like. And believe it or not, even though I enjoy the new studios we build, I am especially fond of older studios that remind me of the '80s," he said. "The majority of our stations have at least one full-time engineer. Many of those are backed up by local contract firms," he said. "I like to keep an open mind for new products or other vendors. I'm always open to new concepts in design and technology." "We choose an automation system based on the needs of the market. That can vary. Sometimes we simply move over existing systems if it is in usable shape," Kline said. "When we spec transmitters, every one we buy we consider IBOC. We make sure the transmitter has enough power for combiner loss and that we leave enough space in the buildings to allow for IBOC equipment in the future," he said. "I expect you'll see some of the bigger market groups spending money on it in the next year. Some people I know are already setting money aside for conversion. I'm just not sure when it's going to happen for us. 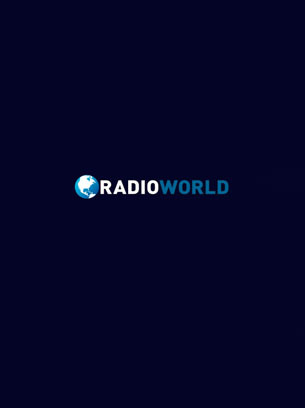 We'll wait to see what the consumer radio manufacturers roll out." Kline is proud in particular of the Cumulus Broadcasting mission statement, which includes the following: "We strive to create the next-generation radio broadcasting enterprise, based on great people and technological excellence that will provide high-quality, local programming choices for our listeners." It's the "technological excellence" part that gets Kline excited. "That means a lot to me. I tell all of my guys that (Cumulus) takes what we do very seriously and that they recognize the contributions of the engineering department," Kline said. "My goal is to make sure each of our markets has the best technical facilities possible."